My husband and I chorused upon seeing the video that we just shot. “But maybe I could work on it” I said, trying to convince my husband and for not making him feel bad about his camera work. “No, you can’t show it, it’s out of focus – the camera was on the wrong setting.”, he said firmly. As much as I want to share a video blog today, I am unable to. Apparently, the pocket camera’s setting was set to outdoor, the whole video was hazy, which he didn’t notice because of the small screen. “No worries” was my reply as I reviewed the whole segment. I saw that I wasn’t fully prepared. My lines looked too rehearsed, I talked like a robot… I realized I was the one who was not focused. So here my friends is the dish that was supposed to be on video. Even though the video was out of focus, I’m quite pleased that it came out nicely in my photos. Whisk together the vinegar, cooking oil, thyme and garlic. Add salt and pepper to taste. Soak the pork slices in the mixture. Marinate the pork for 30 minutes. Heat a charcoal grill. Grill the pork slices for 10 to 12 minutes. Let it cool. Slice into strips. Best served with a side of mango ensalada. And oh… you could get the recipe for the Ensaladang Manga here. This has been another recipe shared by Skip to Malou. Connect with her on Facebook and Twitter! © 2012, Malou @ Skip to Malou. All rights reserved. 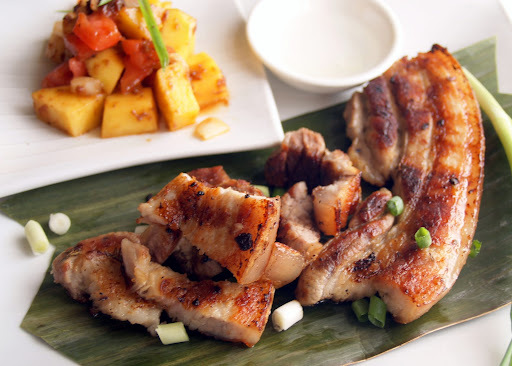 Malou Nievera is the creative driving force behind the food blog Skip to Malou. She"s the blog's recipe developer, writer, cook and photographer. Through Skip to Malou, she shares her easy and simple recipes that specialize in Filipino and Asian dishes. Malou’s passion for cooking and her sharing the stories behind each dish makes her food blog unique and memorable. Her stories are about family, friends and the happiness they all share. Come visit her atwww.skiptomalou.net and partake in the celebration of her life as a wife, mom and as a Filipina living in America.